We just witnessed one of the most absurd, embarrassing hearings in recent Washington memory. Chuck Hagel appeared before his former colleagues on the Senate Armed Services Committee on Thursday, seeking their approval for his nomination to serve as secretary of defense. What followed was one of the most absurd, embarrassing hearings in recent Washington memory. Senators battered Hagel for even small departures from accepted conventional wisdom, subtly (and not-so-subtly) charged that he actually sought America’s destruction, begged him to keep defense spending headed towards their state, and generally thrashed traditional notions of the Senate’s role to “advise and consent” on cabinet appointments. Senator James Inhofe, R-OK: The question I’d like to ask you, and you can answer for the record if you like, why do you think that the Iranian foreign ministry so strongly supports your nomination to be the secretary of defense? Senator Lindsey Graham, R-SC: Do you believe that the sum total of all of your votes, refusing to sign a letter to the EU asking Hezbollah to be designated a terrorist organization, being one of two to vote [against] designating the Iranian Revolutionary Guard a terrorist organization, being one of two on two occasions to vote against sanctions that this body was trying to impose on Iran, the statements you made about Palestinians and the Jewish lobby, all that together—that the image you’ve created is one of sending the worst possible message to our enemies and our friends at one of the most critical times in world history? Senator Joe Donnelly, D-IN: When we were together, I mentioned to you my visit to Crane Surface Warfare Systems, in Indiana. What they do is they work to create the technologies to control the spectrum, in effect try to win the battlefield before the battle starts on the ground. And so, we were wondering, what can be done, in this time of challenging budgets, that in the area of technology, in the area of spectrum, we can maintain our budget so that, as I said, before the war is ever started on the ground we have won it on the spectrum level? Senator Richard Blumenthal, D-CT: I would like a commitment that you are committed as well to a fleet of twelve Ohio-class replacement submarines. Senator Jeanne Shaheen, D-NH: Our four public shipyards are the backbone of our naval power. But according to the Navy there’s huge backlog of the modernization and restorations projects at our shipyards.… Will you commit to ensuring that this modernization plan is produced, and will you commit to pressing the Navy, within the fiscal constraints that I appreciate, to fully fund the improvements in the long term? Senator Mike Lee, R-UT: I understand that you have made a statement that there is no justification for Palestinian suicide bombers, but there is also no justification for Israel to “keep Palestinians caged up like animals.” Did you say it, and if so do you stand by it? Senator Roger Wicker, R-MS: You have corrected the term Jewish lobby. And I assume the correct term now is Israel lobby or Israeli lobby. Do you still stand by your statement that they succeed in this town because of intimidation, and that it amounts to causing us to do dumb things? 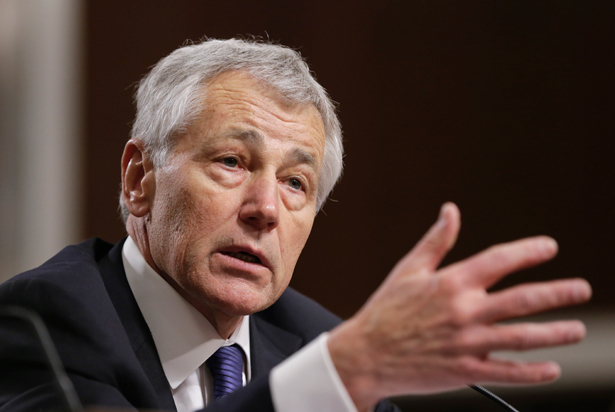 In an ideal world, we would have a better nominee than Chuck Hagel for Secretary of Defense. But in the real world, he's a pragmatic choice who may actually fight bloated defense spending, the all-powerful Israel lobby and warmongering of all stripes, Phyllis Bennis writes.